The fourth-ranked University of Virginia men’s basketball program made a 33-18 halftime advantage stand, holding off previously unbeaten and 25th-ranked Wisconsin, 53-46, to claim the 2018 Battle 4 Atlantis championship. The Cavaliers never trailed as they improved to 6-0. This marks the sixth-straight year in which UVA has captured an in-season tournament title. Terrific execution on both ends of the court helped Virginia build a significant advantage in the first 20 minutes. Tournament MVP De’Andre Hunter (12 points) and guards Ty Jerome (9) and Kyle Guy (6) spearheaded the offensive attack, combining for 27 of the Cavaliers 33 first-half points as the Cavaliers shot 50% from the field. True freshman point guard Kihei Clark, receiving the first start of his short collegiate career, sparked an excellent defensive effort. He badgered point guard D’Mitrik Trice, who scored 16 and 25 points in wins over Stanford and Oklahoma, from beginning to end. Trice was held to five points in the game on 2-of-9 shooting and committed three turnovers, thanks in large part to pesky defense from Clark, who logged a career-high 37 minutes. Wisconsin made just nine-of-25 shots (36%) in the first-half, missing on all five 3-point attempts. Virginia built a 15-6 lead early but had only a 21-16 advantage at the 5:01 mark, when Wisconsin star center Ethan Happ picked up his second foul and headed to the bench. When Happ re-entered with roughly two minutes remaining, the Cavaliers had extended the lead to 29-16 thanks to 3-pointers by Guy and Jerome and a Hunter layup. A Jerome layup as time expired lifted the Hoos to the 15-point halftime edge. The Cavaliers went ice cold from the field in the second-half, making only 7-of-28 shots from the field. As the Hoos struggled to put the ball in the basket, Wisconsin inched closer, cutting the deficit to five points on three separate occasions. UVA had an answer all three times, though, beginning with a Guy jumper to make it 42-35 with 8:48 to play. Then, a Hunter layup gave Virginia a 51-44 lead at the 1:21 mark. Wisconsin pulled to within five points once more on a Happ layup with 1:11 remaining. Jerome missed a jumper, but center Jack Salt tipped an offensive board to Guy, who was fouled with 28 seconds left. Guy sank one of two free throws, Clark came away with a steal on the other end, and Hunter sank one of two free throws for the game’s final score. Hunter finished with 20 points on 8-of-14 shooting and secured nine boards, leading the Cavaliers in both categories. The Battle 4 Atlantis tournament MVP averaged 19.3 points on 61.7% shooting and 7.7 rebounds per game in wins over Middle Tennessee, Dayton and Wisconsin in Paradise City, Bahamas. Jerome struggled with his shot against the Badgers, particularly in the second-half, but finished with a good all-around effort with 11 points, five assists, three steals and zero turnovers. Mamadi Diakite provided UVA’s only bench points, making both field goals and both free throws for six points in 17 minutes. 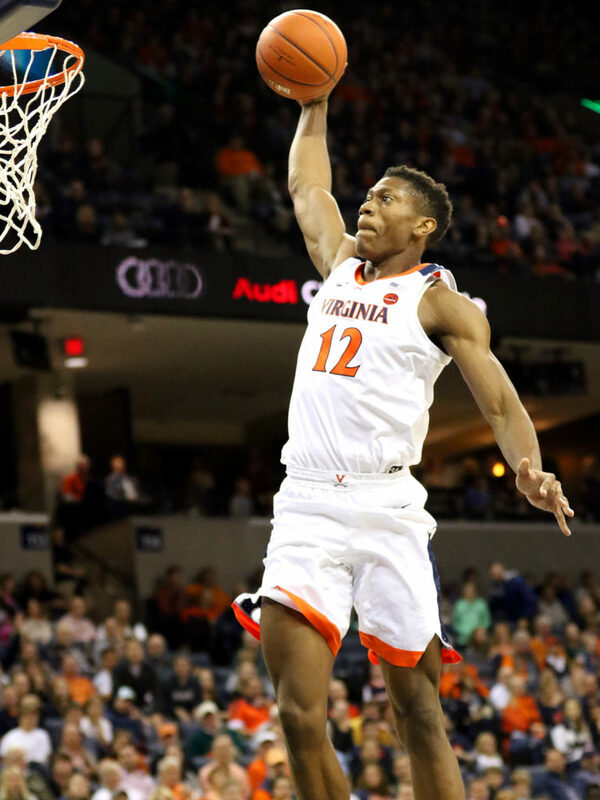 Four of Diakite’s six points came in the second-half, when the Hoos mustered only 20 points. The Cavalier defense looked as sharp as it has all Thanksgiving weekend, holding Wisconsin to 43.8% shooting from the field, including 18.2% from 3-point range. The Badgers made only two 3s on Friday after sinking 14-of-22 in its semifinal win over Oklahoma on Thursday. Happ was the only Badger in double-digits, finishing with 22 points on 11-of-19 shooting while the rest of the Wisconsin team made just 10-of-29 from the field. No other Wisconsin player reached double-digits in scoring. Happ’s 15 rebounds gave him a third straight double-double this Thanksgiving weekend, but he also surrendered six turnovers as he battled Salt for most of the night. Bennett said: “Jack Salt was a warrior. We trap the post a lot and we didn’t do it as much” as the redshirt senior center guarded Happ one-on-one the majority of the second-half.